We, at The Clock Register, are convinced that a world-wide, open-source collection of clock information, that grows all the time through the contributions of its Members, will help conserve clocks, raise the professional profile of the antique clock market and make even more people enthusiastic about them. Lofty aims? You bet! But we are rolling up our sleeves and going for it and hope you will join in. There is a lot here for everyone. If you are a professional working with antique clocks, a clockmaker, conservator, restorer, curator, dealer, auctioneer, clock retailer, tutor or student, a collector, or if restoring antique clocks is more of a hobby, but still your passion ... this website is for you! Our aim is to make The Clock Register an indispensable resource for anyone working with antique clocks. A resource, to which our Members come to find and contribute information about clocks. Clocks they are working on, they bought or sold, they want to sell or buy, or to see photos of, including photos of hard-to-find clock parts. The Clock Register will store more and more information and hold it forever. So, future generations will not have to wonder "who on earth has worked on this clock before? ", "why was this lifting piece bent this way? ", "who have been the owners of this clock and when?" or "is this clock a marriage of parts or is it truly original as it is?" These are questions "us clockies" grapple with everyday. To collect such detailed and diverse information, of course, requires a lot of work. Who is going to enter all that information? Well, the short answer is... all of us! If we all contribute a little about what we know, collect and work on, The Clock Register will be a truly valuable resource for us all. Before you know it, it grows so substantial, that virtually anything you ever want to find about an antique clock, can indeed be found in The Clock Register. As the name indicates, The Clock Register is there to "register" whatever happens to a clock, so people who use it will be better informed to buy, sell or conserve that clock. To incentivise you to participate, we reward you with Clock Credits when you add ("register") a clock or clock photos. While searching and viewing the result screen of a search is free, you will lose a few Clock Credits when you open the detailed term sheet of a clock, owner or conservator. Also, when you contribute photos of your clocks and clock parts, you can earn money when people click on them. 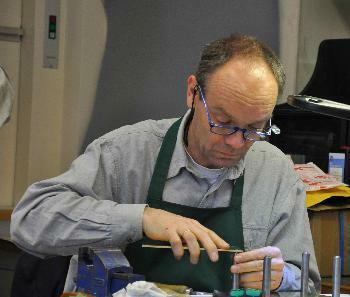 After studying antique clock conservation and restoration at West Dean College (United Kingdom) in 2008-9, Marc ter Kuile set up his own clock conservation business, TerKuileClocks. While working on antique clocks for clients, Marc realised that most of the story was missing. "Who had worked on this clock before? ", "why did that gathering pallet look so unusual for this type of clock? ", "who made the clock in the first place?" and "who has owned it in the last 200 years? ", "at what price was it last sold? ", "where was it auctioned?" So, The Clock Register becomes a tool to take the guess work out of clock conservation, dealing and collecting. The Clock Register makes transparent what's happening to a clock over its life time. Marc trained as an electrical engineer, then became an investment banker and then an internet entrepreneur. Now he works as a clockmaker at TerKuileClocks and as the instigator behind The Clock Register. Marc works and lives in the South East of England. If Marc is not working on a clock, he can be seen in the local film society, on a volleyball or tennis court, or reading up on the latest technical innovations. We envision The Clock Register to serve as a common tool for everyone working with clocks to fulfil a key role in clock conservation, dealing and collecting. If you want to be part of this exciting effort and reap the benefits, please join us now. So, join us now to become a Member, search for clocks and photos, add your own photos to earn some extra money, take the Expert test, register your clocks, offer them for sale and get on the list of clockmakers, musea, owners or auction houses.